There are four types of teeth in your mouth. Each type has specific functions as you bite and chew through your food. Without them and your natural saliva, we would not be able to process and prepare the food we eat well enough for healthy digestion. The first crucial step in the pre-digestive process is to chew food thoroughly in order to break the larger food particles down. Once they have been broken down into smaller particles, they are more easily swallowed, digested and absorbed into your body. This helps your body to obtain nutrients from each meal you eat more efficiently. In other words, nothing goes to waste! The incisors are the eight thin, flat and sharp teeth in the front of your mouth. You have a set of four at the top and another four at the bottom. Incisors have a sharp biting action that cuts food into a chewable-sized piece. You have four sharp and pointed canine teeth, otherwise known as cuspids or “fangs”. 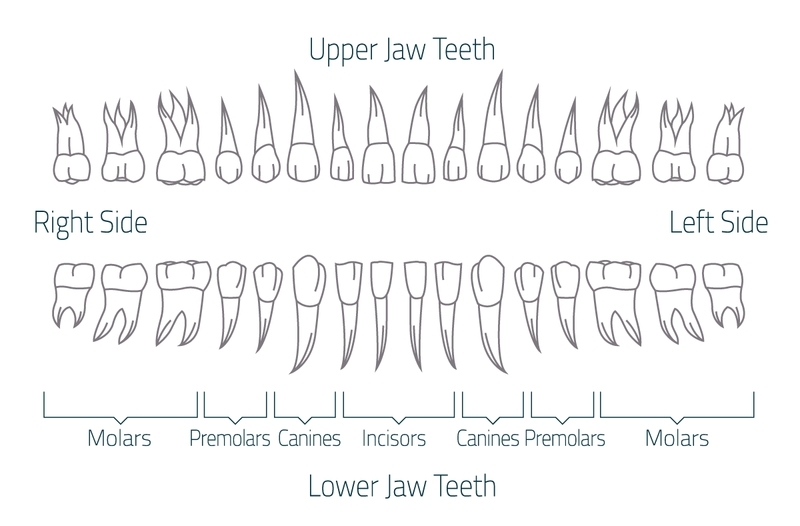 There is a canine tooth on both sides of your upper and lower incisors. Your canines can help to grip and position food (like an apple) before you bite down. They also assist in tearing food. Next down the line are the premolars, otherwise known as bicuspids. They have a flattened top. There is a pair of premolars situated behind each canine, making up a total of eight premolars. Premolars help to tear, split and break up food before sending in down to the molars for grinding. At the end of the line, you have a set of three molars behind each pair of premolars, making up a total of twelve molars. They are your largest and flattest teeth. Your molars are the workhorses in your mouth. They mash, grind, crush and chew food with saliva and digestive enzymes until it is ready to swallow. Look after your teeth for life – to experience the health benefits from being able to chew your food thoroughly!